From time to time I've heard readers of fantasy lament the inclusion of a map at the beginning of a book. Such a tired cliche, they say. How sad that, ever since Tolkien and Lewis, every fantasy author feels the need to include a sketchy layout of their imagined world. A few of these critics admit that a map might be acceptable so long as it has a real, in-story reason for being there. 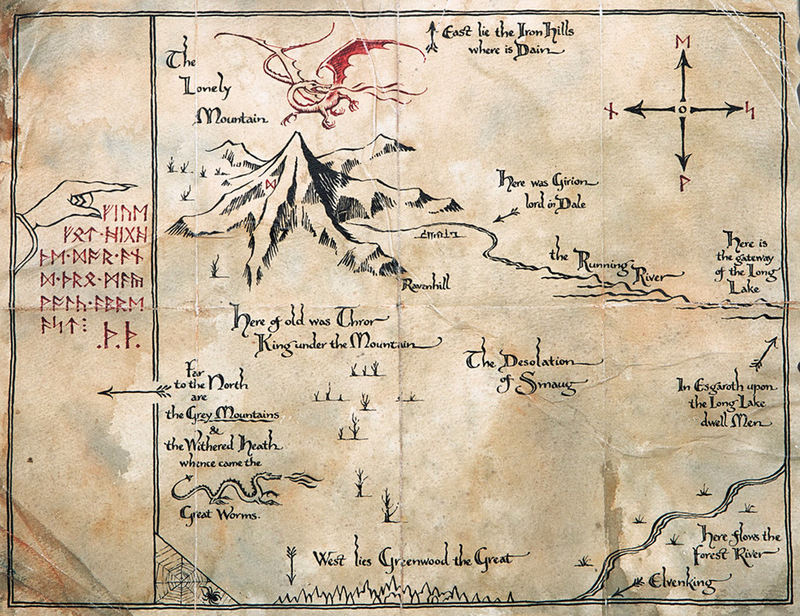 Witness, for instance, Thorin's map leading to the Lonely Mountain, with its nifty moonlight lettering of secret instructions. The map's mentioned in the book. So it's ok. Here's the thing. This is Secondary World fantasy we're talking about. Fantasy that takes place in an alternate reality bolstered by a "secondary belief" that the author (hopefully) evokes in the reader. We don't need maps for narratives that take place in the space of our primary belief, do we? We don't need a map of Harry Potter's England...it's just England. Open an atlas. Go to GoogleEarth. If we're told that James Bond takes a private jet from Heathrow to Monaco so that he can play baccarat, we can picture that trip. But if we're told that Eddard Stark needs to get from Winterfell to King's Landing, we have no context without a little cartography. We take for granted the layout of the real world, our mother Earth. We can't do that for imagined worlds. These maps are necessary details that enrich the experience of the novel. I've put together a little sample packet in PDF form, representing the most current revisions of chapters one, two, and three. 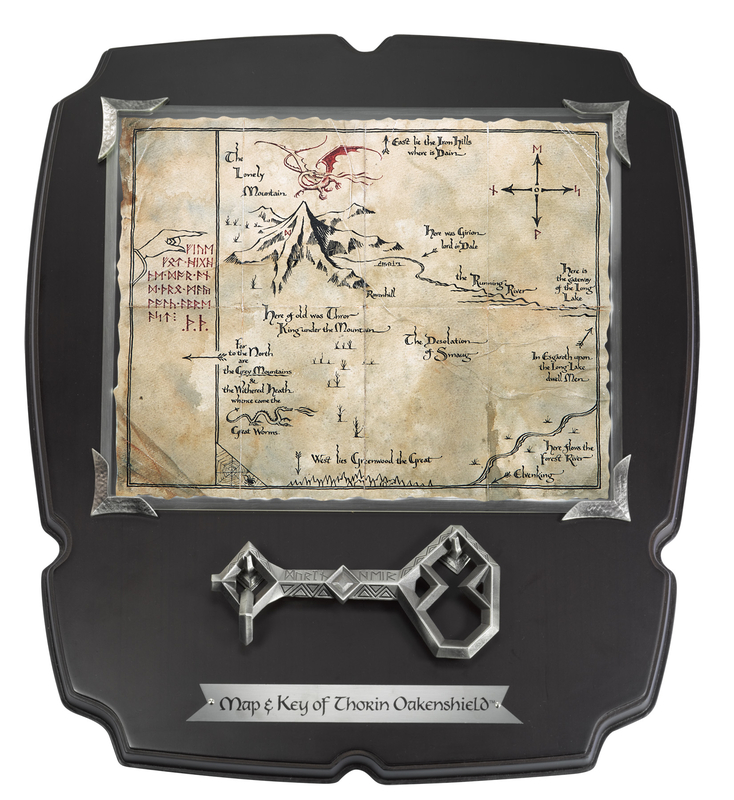 It also has the nice new map, and an updated graphic for the title. Here is a small version of the PDF, with lower-resolution graphics. 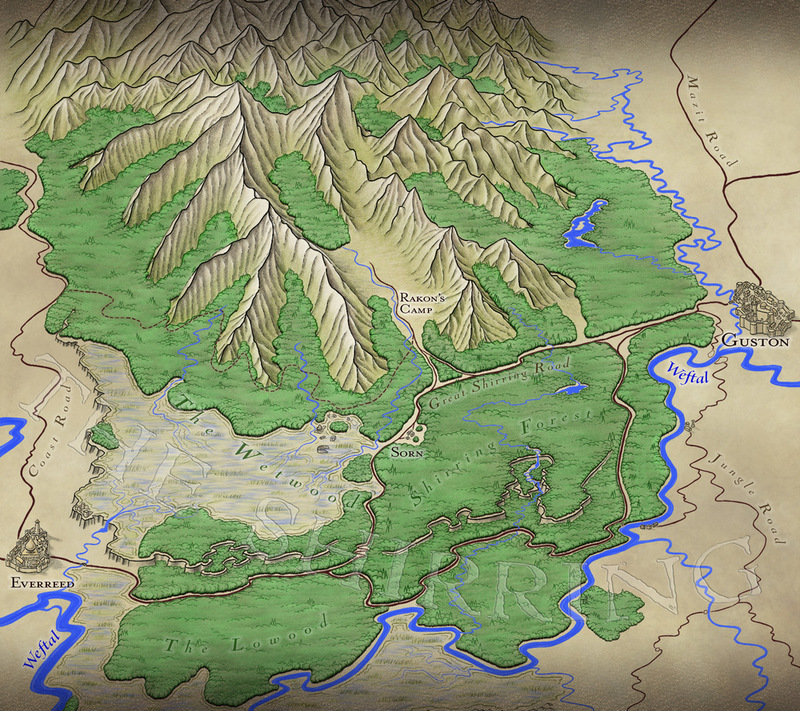 Here is a high-res large PDF, where you can see the map in full glory. This is the kind of thing I'm happy to distribute, and I encourage all of you reading this to share. It's copyrighted work, but I'm issuing these three chapters under a creative commons license. This means you're free to share it around, print it up, etc. I'm a full believer in the try-before-you-buy philosophy. Those of you who've read "revision one" of these chapters will find some interesting new material that hooks into later chapters in the novel. Incidentally, should you wonder how a swamp could fill a highland area near a cliff, here is the explanation. The area of the Wetwood is a vast and shallow basin, lined with clays, and the cliff region is raised slightly, forming a lip (except where the great waterfall drains the flow from the swamp and empties into the Weftal by Everreed.) I was inspired a bit for this "high swamp" concept by the boggy area on top of the island of Kauai, which drains into a spectacular canyon. Everything was drawn by hand in on the iPad in ProCreate, the best drawing program available in the App Store. I use a stylus when I draw, usually an Adonit Touch or a Hex3 Jaja. The text labels are the only thing that was done in Photoshop. But how else will I set the scene? Some things we do are complex. It’s natural to seek advice about “the right way” to do them from those who have gone before, especially when first starting out. Imagine you know little of carpentry, but have ambitions. You could go to Domicile Depot, buy a bunch of wood and nails, then set about building yourself a house. With decent problem-solving skills, you might be able to throw up a structure able to withstand a stiff breeze. You’d likely be in for some discomfort the first time it rained. Humans have been building shelters for…oh, let’s say fifty-thousand years. Load-bearing mammoth tusks supporting hide roofs. There’s been a lot of progress on that front in the intervening centuries, and that progress was passed down as knowledge, and much of that knowledge has been recorded. Luckily for you, some of it is almost certainly recorded in a language you can read. It would be foolish or arrogant—or both—to plow right into a complicated endeavor like home construction without at least trying to partake of that font of knowledge. We’re social creatures who learn from each other. In fact, we’re the acme of the animal kingdom when it comes to learning from each other. No need to reinvent all those metaphorical wheels: just draw upon the best practices of the past. Picking the best advice is important, of course. Lots of people are sharing their expertise, but some are more expert than others. Some are charging for their advice—nothing necessarily wrong with that—but that poses another question: is it worth the cost? Sometimes free advice from a master is far more valuable than a paid class taught by a poseur. Being a humble learner, an eager padawan, an honest seeker of truth impassioned to acquire expertise, you look for tutorials, demonstrations, treatises, and blueprints. You find blogs or YouTube videos by those who have gone before you and want to give back. You look closer and closer at the objects of your passion—the instantiations of your chosen craft that you encounter in the world—and you find yourself peering beneath the surface detail as though you were gifted with x-ray vision, picking out the bony scaffolds that give the thing its structure. I do, at any rate. My big, complex task right now is becoming an author. I want to write fiction that people want to read, stories that people love, novels that inspire and entertain. For decades I’ve been looking intently at stories, narratives, films, and books, wondering what made them tick and what factors made a few of them great and many of them not-so-great. For the last few years, I’ve been drinking in all sorts of writing advice. Most of it being the free kind, in the form of blogs, magazine articles, podcasts, etc. There’s a milestone you reach with regards to advice when you’re practicing your craft. Well, there are many milestones, but there’s this one that just struck me: you get to a point where you can disagree. You reach a stage where, still listening to all the advice you can, you suddenly find you know enough to argue back. You see the short-sightedness in something you’ve been told. Then I came to a point I disagreed with. And I knew why. I knew that the advice was generally good, and would have been useful to a novice, perhaps…but it was over-broad. If followed slavishly, the rule would produce a novel without enough stylistic variation. I wouldn’t have had the perspective to see that a year ago. I wouldn’t have had the experience that a couple hundred thousand good words gives me. I wouldn’t have noticed many great writers breaking the very same rule, to good effect. I think the same thing happens for everyone who tries to do something that takes a great deal of education to get right. There’s a moment when you move from being someone who knows so little that all advice is welcome, to someone who knows enough to be able to debate a point or two. You become someone who can tell that some advice is flawed, and can point it out. It’s kind of a great moment to experience. Lastly, let me state that, should I live to be 100 and have scores of novels to my name, I’ll know there’s still lots for me to learn about the craft of writing. There’s always more to learn, and always someone new to learn it from. This is post isn’t about not needing to learn anymore, or not needing any more advice—it’s about that cool transition when you become someone who is more of a participant in your craft than an ambitious beginner. If you're going to use irony, make sure you really mean what you say. Last year, when monologist Mike Daisy was lamely trying to defend the fabrications in his story about Chinese workers assembling Apple products, he tried a number of defenses. He affected a post-modern stance for a while and pointed out that truth was fuzzy, and relative. Sure, buddy. Then he took a different tack and pointed out that he's an essayist, and that the word "essay" means "to attempt"...so he should be allowed to attempt a description of Apple's labor practices in China, even if that attempt failed in terms of the facts. He only claimed to be trying, you see, not succeeding. But he's more wrong than he knew. Because "essay" actually comes from late Latin, the verb exigere, meaning to ascertain or weigh. When the form of the essay was being developed by Montaigne, in 1500s France, the Latin exagium (weighing) had become Old French "essai", meaning "trial". Now, in terms of activities like artistic endeavors, there is a modern sense that "an essay in the craft" is merely an attempt to make something in a particular mode, or with a certain method. But this is applied to efforts and actions, and is a different sense of the word from the "piece of short writing on a subject". The true root of "essay", especially in the form of the written document, does not, and never has, translated to "something immune from judgment because it's just an attempt"—though I know from experience that this is a common definition in many classrooms. No. It means: To put an idea to the test. To bring reason to bear in a non-fiction, long-form argument, giving the notions within a careful weighing. To put a concept on trial. If I were a philosophy professor grading Mike Daisy on his apology (in both senses), I'd mark him guilty of the fallacy of equivocation. I've just posted "The World is Written." It's chapter thirteen, and one of the most important, central, "pivotal" chapters of the novel. Fun, intrigue, suspense, foreshadowing...this chapter has it all! 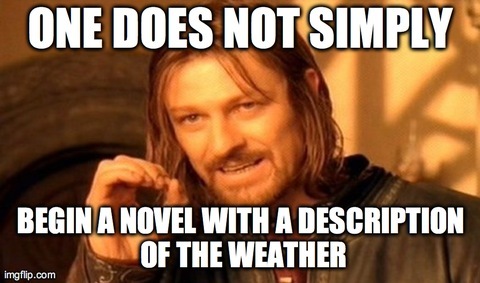 Plus, you will finally catch the origin for the title of the book. It's a bargain at twice the price. Download it for free on the Novel page, or use this direct link. Think ye she be but legend? Feh. I seen her, I says. Wit' mine own eyes.